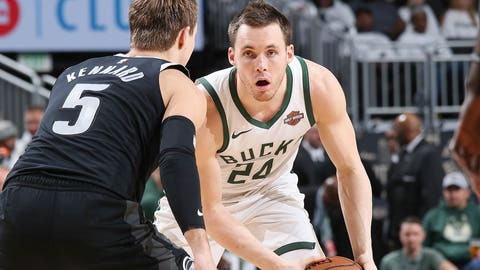 Maybe we'll see Milwaukee's starters play more minutes in closer games, but it should come as no surprise that the Bucks are going with what worked in the regular season in terms of running their offense. Despite winning by 35 points, and leading by more than 40 at times, Milwaukee took a lot of deep shots. A lot. During the regular season, the Bucks averaged 91.1 field-goal attempts and 38.2 3-point attempts, making 35.3% from downtown. In Game 1 against Detroit, Milwaukee took 90 shots, 43 of which were 3-point attempts (making 34.9%). All 11 Bucks players had at least one 3 attempt. 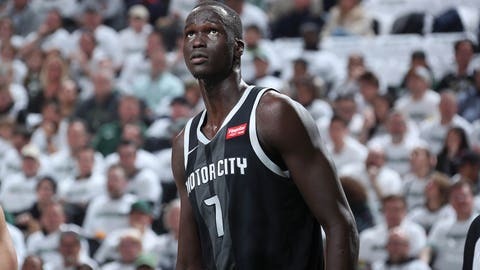 His former teammates said all the right things about Maker before Game 1, how they knew he'd provide energy for the Pistons, etc. But Maker had no chance trying to guard Giannis Antetokounmpo. Just over a minute into the game, Maker committed two fouls on Antetokounmpo. When Detroit called timeout with 8:25 left in the first quarter, Giannis already had eight points and four rebounds. Maker would finish with four points and four rebounds (and four fouls) in 22 minutes. #PlayoffThon didn’t show up. Can anyone match the Bucks’ depth? 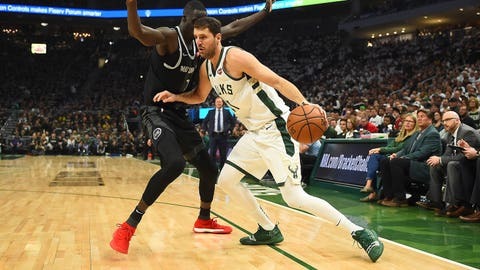 Head coach Mike Budenholzer changed his rotation throughout the season, but one thing all the mounting injuries did for the Bucks was get bench players a lot of playing time -- which served them well during the regular season and bodes well in the playoffs. 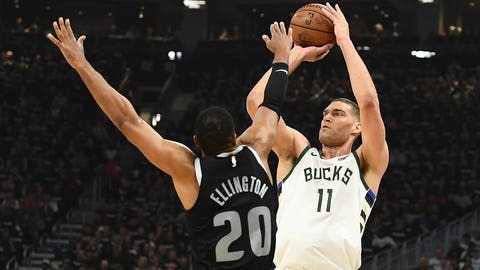 Milwaukee, which had five players tally 1,000+ points this season, had seven players in double figures in Game 1 -- Antetokounmpo (24), George Hill (16), Eric Bledsoe (15), Brook Lopez (14), Khris Middleton (14), Sterling Brown (11) and Pat Connaughton (10) -- while Tim Frazier added seven and D.J. Wilson six in limited minutes. 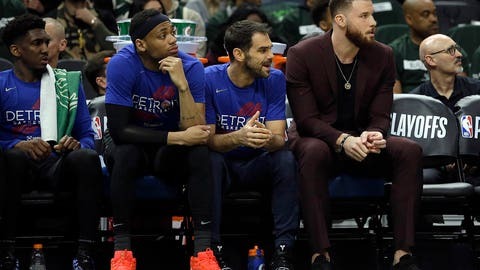 Griffin is on Detroit's bench -- he even got a technical foul -- but that's where he sat in Game 1, out with a knee injury, and reportedly will remain throughout the series. Detroit already faced a tough task against Milwaukee; without Griffin, well, we hate to use the word impossible … how about highly improbable? As mentioned above, Maker couldn't guard Antetokounmpo. Andre Drummond tried as well and he ended up with a game-worst box score +/- of minus-45. Is it too early to start checking tee times?